I’ve heard a lot about this weightlessness stuff, with astronauts having a great time floating around. So I wanted to find out first hand what’s going on up there. Since they don’t have a spare seat on the next flight to low Earth orbit (at least not yet), I looked far and wide to find an amazingly tall mountain whose peak rises to the Space Station’s altitude in orbit so I could climb up and see for myself. Station orbits the Earth about 260 miles (420 km) above sea level, and, by the way, crew and station are zipping along at 4.7 MILES PER SECOND (7 km/sec) relative to you sitting there at your computer. Bam. The Station just moved 4.7 miles. Really. It took some Googling, but I found it! See my mountain in the picture? 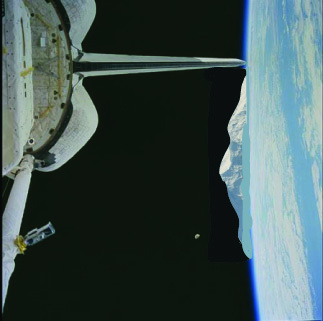 It accidentally got captured in an old Space Shuttle photo. Mt. Everest is only 5.5 miles (8.8 km) high. MY mountain (Jeff’s Peak) is 260 miles (420 km) high. I found it south of the Land of Make-Believe, down a not too well traveled path. Still, you’d think someone would have noticed it since it’s 47 times higher than Mt. Everest. Have you ever heard of Jeff’s peak? No? See, nobody knows about it! So this week, I’m going to take the time to climb my mountain, and in my hand is my trusty bathroom scale, spring-loaded and guaranteed to be accurate at any altitude. I’ll camp out at the top, and I’ll wait until Space Station flies right by my mountain, so I can look in the windows and see if those lucky astronauts are weightless and floating around. As soon as I confirm they’re weightless in the Space Station, I’ll step on my bathroom scale to see my weight. If I weigh say 150 lbs (68 kg) when I’m standing on my scale in my bathroom at home, what will I weigh on top of my mountain? Post your guesses below, and remember to include why you think your guess is correct. Students of ALL ages are welcome to post a guess. I’ll even give you until the end of the week to noodle on this in class, and at home with your parents, and then post your guesses. I’ll post the answer this Friday, September 20, 2013. See you then, and good luck noodling!